Since this panel was first published in 1921 it has aroused interest and debate among experts in the work of Adriaen Brouwer, particularly during the first half of the 20th century. The panel was auctioned in 1921 as an autograph work by Brouwer. It was acquired for the Thyssen-Bornemisza collection in 1928, having been purchased from Jacques Goudstikker in Amsterdam, again as an autograph painting by the artist. The panel was included in all the Collection’s catalogues as an original until 1990. In the earliest catalogues, including that of the Munich exhibition, it was simply entitled Landscape, while from 1969 it was entitled Landscape with Peasants drinking. It was Gaskell who was responsible for the present attribution and title. The panel was considered an autograph work by Bode in three publications published in the years immediately after the auction of 1921. Marlier also thought it to be autograph in the commentary to the catalogue of the exhibition Le siècle de Rubens in which this painting was included, while Ebbinge-Wubben shared their opinion in the 1969 catalogue of the Thyssen-Bornemisza collection. However, other art historians rejected it, including Böhmer and Gaskell. Their principal objections include the treatment of the subject, the unusual shape of the panel within Brouwer’s oeuvre and the differences in the quality and handling of the painting in important zones such as the figures, buildings and landscape. 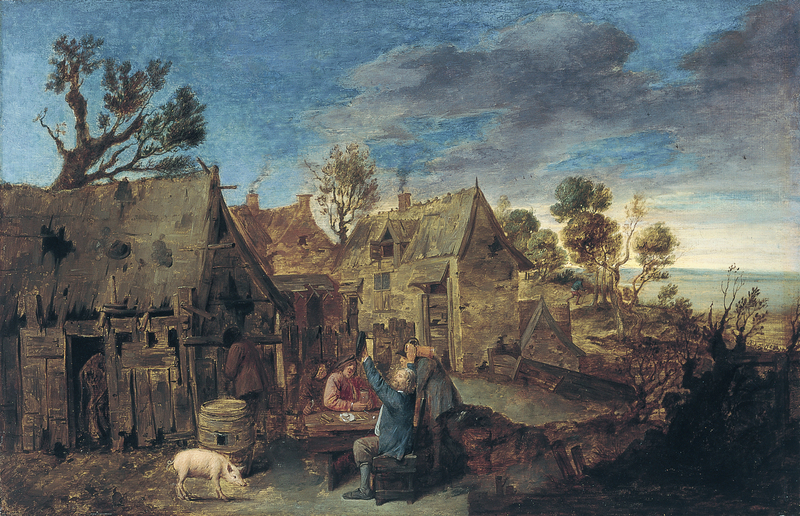 The scene takes place on the outskirts of a poor, rundown village in which four men are gathered around a table to drink outdoors in a moment of leisure. The predominant tones are browns and greys, used to depict the buildings as well as the trees and shrubs in the foreground. The almost monochromatic palette is broken by the bright colours of the clothes, particularly the combination of pink and blue, as well as the intense blue of the sky. As with other subjects by Brouwer, these drinking peasants have been interpreted on a further, conceptual level in which these rough, crude types are considered to stand for certain aspects of human conduct. The direct forerunners of scenes of this type, which generally involve the consequences of excessive drinking, are to be found in 16th-century art.